I've read these stories (The Time Machine, The War of the Worlds, and "The Country of the Blind") multiple times, and enjoyed them every single time. I also think the moral lessons of these stories are under-appreciated, and I'm not even sure most people are aware "The Country of the Blind" exists, sadly. Anyway, this particular version is my new-found favorite. The text is beautifully laid out, and the artwork is simply gorgeous. 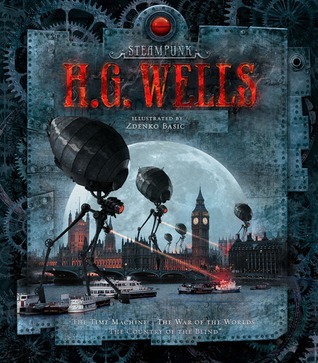 Wells and steampunk go together like tea and scones, in my opinion, and Zdenko Basic is an amazing artist. I am very much looking forward to the rest of the series. I actually liked the idea for the collection. Combining H.G. Wells’ works with steampunk pictures sounds pretty awesome, and for the most part, it was. I really liked the pictures. If I was rating on the pictures alone, this book would score pretty high. They were very pretty, and I really enjoyed seeing different parts of the stories come to life.It was also really neat seeing the different steampunk aspects added into the story. The stories themselves were unchanged, which I appreciated because I think I would have been upset if they had actually changed Wells’ writing. The steampunk elements were added through the pictures alone. It was awesome to see all the little details that were in the pictures, and how the illustrators tried to represent the theme. The one thing I didn’t like about the overall collection was the size. It wasn’t that thick, yet it was heavy! The pages were pretty thick, which I think added to the weight. I actually stopped taking it to work to read on my lunch breaks because I found it was annoying. It was annoying to even hold the book up, so I preferred reading with it set on something. While the book was quite beautiful, the enjoyment of reading it was ruined by the physical object.